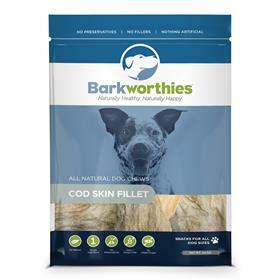 Barkworthies Cod Skin is a chewy and flavorful treat packed with beneficial vitamins and minerals. These treats are packed with collagen and Omega-3 fatty acids which can help maintain a healthy skin and coat. Barkworthies Cod Skin is a delicious dog treat that contains healthy fats that are good for the heart and can help boost immunity. Your dog can get all these benefits from this single-ingredient treat! Treat your dog to a full piece (depending on their size), or cut it up to make a great bite-sized training aid.